Cacao or cocoa powder is the dried and ground, fully fermented fatty seed of the Theobroma cacao tree. The tree itself, is native to the deep tropical regions of Central and South America. 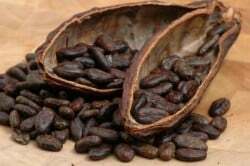 Cocoa solids and cocoa butter are extracted from the cocoa beans. These extracts are the main ingredients of chocolate – probably the most popular of the sweets on the planet. Not many people know that apart from its culinary uses and health benefits, cacao also has mild psychoactive properties and it is one of the few psychoactive plants you can buy at almost any grocery store, along with nutmeg. There is also some ambiguity regarding, whether or not cocoa and cacao are the same things. Some articles out there seem to “uncover” the differences between the two. They are saying that cacao powder is ground, raw cocoa beans, whilst cocoa powder is made from the processed beans, and has less nutritional value. However, several sources, both official and unofficial suggest that the two are in fact the same, and naming a product “cacao powder” instead of cocoa is merely an excuse for certain health food shops to sell it at a higher price. 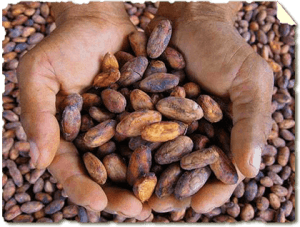 The American Food and Drug Administration (FDA) seems to be using the two words interchangeably in its “Requirements for Specific Standardized Cacao Products” document. 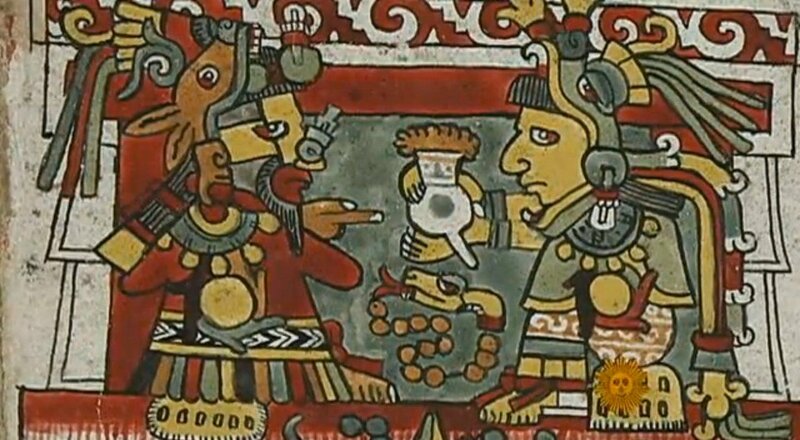 An Aztec painting depicting a shaman drinking a psychoactive “cacahuatl”. These cacao drinks were sometimes merely a vehicle for Datura stramonium, possibly DMT-containing Virola barks, psilocybin mushrooms and many other massively psychoactive herbs. These were not exactly the kinds of hot chocolate drinks we associate with christmas fairs. Cocoa is legal in every country around the world. Some cocoa products are available in nearly every grocery store worldwide. However, you have to look for 100%, pure cocoa powder, without added sugar. If you are trying to experience the full theobromine high you need organic, un processed cocoa beans and nibs, see below. 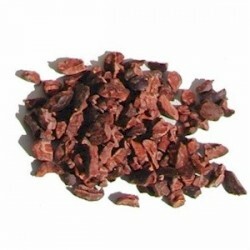 If you are interested in experiencing the full spectrum of the psychoactive effects of theobromine I strongly recommend organic, unprocessed cacao nibs. I cannot currently recommend any shops in Europe, that would sell theobromine rich, organic cacao. The main active ingredients in cacao beans are theobromine and caffeine. Generally, caffeine and theobromine are said to be responsible for the psychoactive properties of chocolate. Studies have shown, that there is approximately 26g of theobromine and 24g of caffeine in 1kg of unprocessed cocoa beans. Chocolate products also contain considerable amount of theobromine and caffeine. There is substantially more of both substances in dark chocolate. The ‘strongest’ chocolate product of Hersey, called SCHARFFEN BERGER 82% Extra Dark Chocolate Bar for instance, contains 370mg theobromine and 42mg caffeine in a 43g chocolate bar. That is, approximately 8.6g theobromine and 0.98g caffeine per kg. Some consider the “cocoa high” merely a placebo effect and others attribute it to the general pleasure of drinking or eating something very sweet. And other attribute it entirely to caffeine. 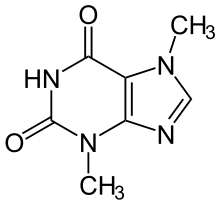 However, theobromine is a stimulant, with effects “milder and longer lasting” than caffeine’s. Enhanced mood is often reported as well. Theobromine is also reported to make one urinate more frequently*. Cocoa is generally considered safe. However, almost anything (even water) can be harmful if consumed in overly large quantities. It has been reported, that very large quantities of theobromine can cause nausea and anorexia. Also, daily intake of 50-100g cocoa (0.8-1.5g theobromine) over a longer period has been associated with sweating, trembling and severe headaches. The dangers of cacao are much greater for pets. Household animals, such as dogs and cats metabolise theobromine at a much slower pace than humans and in their case, fatal “chocolate poisoning” is a realistic possibility. Do not feed your pets chocolate! Cocoa has several proven health benefits. First of all, numerous studies have suggested, that cocoa has beneficial effects on cardiovascular diseases. It has also been reported, that regular consumption of dark chocolate bars for 15 days can reduce systolic blood pressure in healthy subjects. The reason for this, is that some ingredients of cocoa cause significant vasodilatation (they dilate blood vessels). Cocoa also reportedly alleviated symptoms of diabetes during tests. A study in Switzerland also confirmed that chocolate reduces stress. Following 14 days of regular dark chocolate ingestion, stress parameters in the adults with high anxiety profiles became comparable with the generally low-stress subjects. There seems to exist a general consensus, that eating lots of chocolate makes one fat. While in practice, this is probably true, studies have shown that some of the components of the cocoa bean actually have anti-obesity effects. In a study, an identical high fat diet, with or without cocoa, was fed to rats for three weeks. Cocoa consumption led to a significant decrease in total body weight during the test. Cocoa powder’s psychoactive effects are only noticeable when consumed in amounts exceeding the everyday dosage. This is not possible just by eating more chocolate. Only very dark chocolate and unprocessed cocoa powder or beans contain enough theobromine to feel anything. The following is a very very strong chocolate drink made from pure cocoa powder, that is guaranteed to trigger the stimulating effects of cocoa! For this drink you will need organic cocoa powder, or pulverise the unprocessed beans or nibs yourself (recommended). The latter option takes a bit more time, but it leads to a much more enjoyable experience. Go to the next tab, to see how it’s made! This should make you feel comfortable and relaxed, perhaps you will experience some mild euphoria as well. Some people are more sensitive to the effects of theobromine than others. To experience a full cacao high I recommend unprocessed, organic cacao beans or powder. Obviously you won’t trip from cocoa. “Trip reports” are simply how the online legal high community calls any experience with psychoactive substances. “I had read that this bitter, brown powder* is unpalatable (as normal cocoa usually is), so I decided to cap a generously heaped teaspoon of the flour-like substance and wash it down with water. Cocoa is only one of the legal highs included in Simon’s legal high guide, check out the others as well. If you are only interested in legal light drugs, then check out Simon’s legal light drugs for more information. – Coming soon! 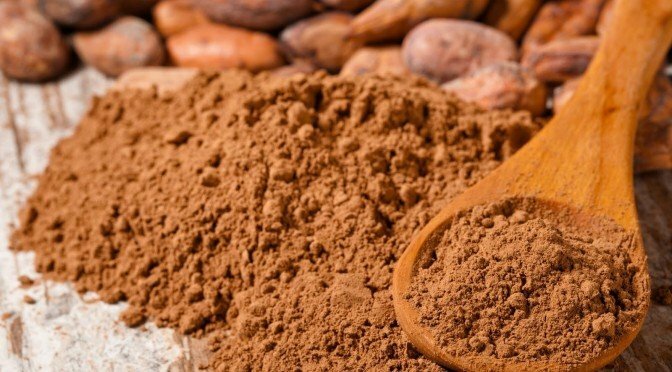 An overview of the uses, ingredients and effects of cocoa powder. Why cacao can be considered a mild legal high (theobromine) and provide you with an extra-strong cocoa drink recipe, that is guaranteed to trigger the stimulating effects of cocoa.